A document condemning Dante Alighieri - one of Italy's greatest poets - to exile from his native Florence is being made available to the public for the first time. The Florence State Archive has printed 2,000 facsimile copies of the XIV century manuscript detailing the charges and sentence against Dante - the author of the Divine Comedy - and will give them to universities and libraries. The copies closely match the original - down to the original binding - but with the addition of explanatory notes. "This is very important. The news of the sentencing to exile of Dante is one of these things we learn at school," Francesco Sabatini, chairman of the organization devoted to the protection of Italian language and literature, told Italian radio. "So, what could seem look a far-way detail of a biography, is now alive before our eyes," he added. The Florentine poet and politician was sentenced by his political enemies. "Dante was a very prominent political personality in 1299-1301 and, in one particular council session he reportedly spoke so violently against the Pope that the notary refused to register Dante's intervention," the editor of the document, Francesca Klein, told BBC News Online. The sentence was passed in early 1302 - at first it was a two-year exile, but only six weeks later it was commuted to death at the stake. 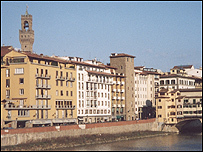 Dante never returned to Florence and spent the rest of his life - almost 20 years - in exile in various cities in northern Italy. During this time, he wrote the Divine Comedy, one of the masterpieces of world literature. One of the main recurring themes of the work is Dante's experience as an exile. The Inferno, the first and most famous part of the poem, sees several of Dante's political enemies punished - in hell. The Florentine poet died in 1321 in the northern town of Ravenna, shortly after finishing Paradise, the last book of The Divine Comedy.